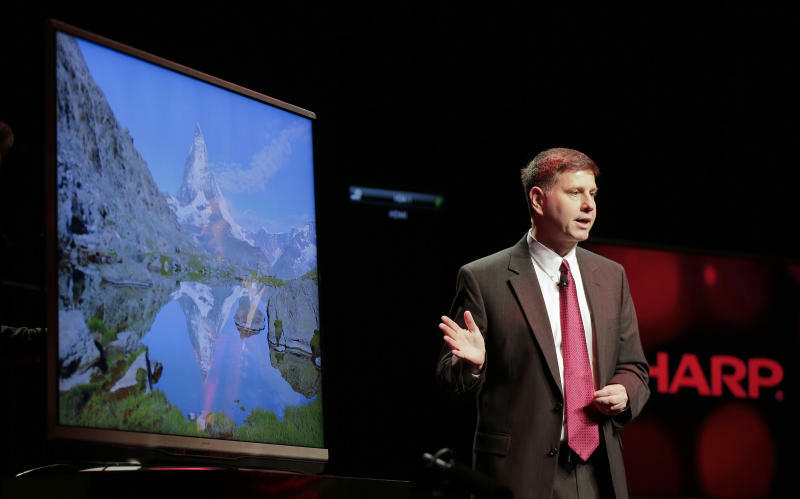 LAS VEGAS (AP) -- Sharp is jumping on the "ultrahigh definition" bandwagon by introducing two super-clear TVs and one ultra-HD computer monitor that will give PC users something to brag about to Apple fans in love with the high-resolution Retina display. At the annual International CES gadget show in Las Vegas, Sharp is showing off a 32-inch monitor that uses its IGZO technology, based on a semiconductor material called indium gallium zinc oxide. Sharp Corp. touts IGZO for its high resolution, low power, and very accurate touch response. The monitor measures 3,840-by-2,160 pixels, giving it about 8.3 million pixel. Apple's largest MacBook Pro with Retina display boasts 5.2 million pixels on a 15.4-inch screen. The monitor, planned for launch in February, responds to 10 points of contact at once — one for each finger.